I am not a keralite. But my village (read)is in south tamil nadu near kerala border. So In our home we prepares recipes mostly related to kerala & Tirunelveli combination. Aviyal & jackfruit thoran both are often prepared in my home. Aviyal (Avial) which is a must in our Sadyas .The word ‘Aviyal’ means a mix of several. As a dish Aviyal (Avial) is a mixed vegetable recipe with thick gravy. . Avial is a semi-dry preparation with mixed vegetables, held together in a yogurt-coconut base. Avial in my house is made with curd(yogurt) for sourness but there are versions with tamarind added instead of yogurt. You can use many vegetables available to prepare this dish but the very common ones are Yam, Ash Gourd, Carrots, Beans, Drumsticks and Raw Plantain (Banana). 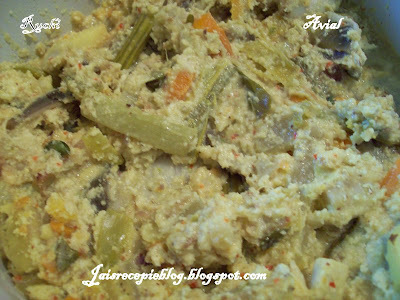 You can also add Cucumber (vellarikka), Raw Papaya), Potatoes etc. This is a great combination with Rice and also as a side dish. Clean the vegetables and cut them into 2 inch pieces and parboil them with turmeric powder and salt. Add only a little water since the vegetables themselves will have enough juice to keep the curry thick gravy. Grate the coconut and grind it with green chillies and cumin seeds to get a smooth paste. Take the cooked vegetables and add the ground paste, salt and curd and Boil for a few minutes and once the vegetables are cooked. Season it with coconut oil and curry leaves.Serve it with Rice. 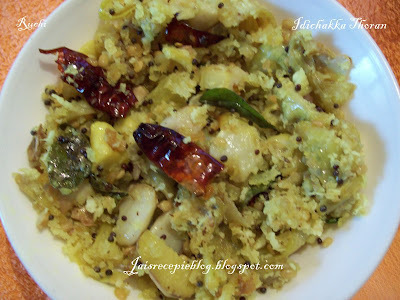 Idichakka (Tender Jack fruit) thoran is a delicious dry dish served along with cooked rice.. Removing the skin and cleaning up the jack fruit is a tedious job but the taste matters. In season, people at kerala /sout tamil nadu make variety of dishes using jack fruit, jack fruit seeds and tender jack fruit. The thoran made up of tender jack fruit is a tasty traditional dish .Idichakka Thoran is a very tasty and is good to be served with Rice. Slice the Jackfruit into small size pieces. Add salt, turmeric powder and cook the jackfruit in a small quantity of water. When cooked, mash the cooked vegetable either using the Ammikallu or in a mixer. Heat Coconut Oil in a pan. Add mustard seeds and black gram and allow them to splutter. Add curry leaves and dry red chillies and fry them for a minute. Add the crushed Chakka to this and mix well. Finally add the coconut and cook them. I Love aviyal,but never had idichakka thoran, would love to try, will try once i'll go to India, coz its kinda hard to get raw jacfruit here..
Tender jack fruit thoran will be tasting great,I once tried at home!! lovely dishes. never had jackfruit thoran.. but i love jack fruit. I love aviyal but never made JF thoran..I love JF...I will definitely try this sometime..Heard the raw JF is good for health..Nice recipie..Tx for sharing..
Wow, both dishes look mouth-watering! I tasted aviyal but never tasted jackfruit thoran! Looks yummy! Both look so yummy..Love aviyal but not tasted the thoran.. The aviyal looks so yummm...i feel like crying, it was my favorite dish and its been ages since I ate it. We just don't get fresh yam here and frozen ones are horrible. I'm gonna make it anyway. hve heard about aviyal,..nd thoran,..ur recipe looks yum,. Aviyal and Palakkai thoran looks very authentic. Mouthwatering dishes. Aviyal and jackfruit thoran looks yummy. aviyal looks yummy, akka. never heard of or had idichakka thoran before. but looks yummy. Avial is my all time favourite! Looks delicious! Idichakka thoran is the one i'm waiting to make.. will try your version!